There was a certain man who awoke in a very dark room, not the kind of room that is pitch black, but the kind of room that is an unnerving, shadow-filled room. It was just dark enough so that he was not able to see the size of the room or what it contained within. The darkness only echoed his fears and loneliness back at him with terrifying clarity, and increasing magnitude. He dares not turn his back on this darkness for fear of being swallowed up. As he slowly inches his way backwards his had brushes against a hard unyielding wall. Surprised, he risks a quick glance at the wall and finds that there are five wooden doors along it. He timidly checks the darkness to make sure that it hasn't come any closer to him and he makes his way to the first door. Kneeling down he looks through the key hole and gasps. Beyond that door lies a beautiful world of light a warmth, and with the sight of it he is filled with hope and peace. 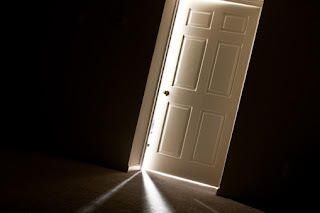 The rays of light shine through the key holes of all the doors and he realizes that it was through these small points of light the ominous darkness was kept at bay. Armed with this knowledge he becomes determined to open these doors and flood this room with light. This person is you. This person is me. He represents every Christian that has awakened and found themselves trapped in a rut of mediocrity and fear. This is every person that has seen where they are and knew that their current place in life is not the limit of their potential in Christ. That dark room represents the world in which each and everyone of live. It is this place where we are strangers and pilgrims (Heb. 11) where we are constantly struggling against the darkness. The world of light and peace represents the relationship that we crave with God. It represents a Spiritual life that is filled with power. Darkness has no place there, (Gen. 1:4, 2 Cor. 6:14) neither does fear (1 Tim. 1:7 ) or sadness (Is. 65:19). The guilt of past mistakes cannot enter into the presence of God because it is a place where He has moved our transgressions as far as the east is from the west (Ps. 103). The door. It is the means by which we are able to enter into the presence of God, break through the limitations of the flesh and leave behind the darkness of this world. If you haven't guessed already, I am talking about prayer. Now before you go to the next article and write this off as basic and irrelevant please read on. The prayer that I am talking about is, life changing prayer. Not just the prayer that we offer up while we are at church, but a constant communication between us and God. This isn't a quick five minute offering, but a "pray without ceasing" type of prayer life. There were several doors mentioned earlier and this represents the different types of prayer, or ways to access the presence of God. Yet before we go any further it must be established that all prayer must be done in the name of Jesus. If you do not access the Spiritual realm in the name of Jesus you open yourself up to many things that will have the opportunity to destroy you. If by any means you have tried meditation, trances or seances you have entered very dangerous territory and please go to your pastor as soon as possible. Also it must be noted that all prayer will be line up to the Bible, if anything comes forth that detracts the deity of Jesus is in the Spirit of the Antichrist (1 Jn. 4:1-3). The definition of praise is the extolling or exalting of a deity. It comes from the Latin word "pretiare" which means to prize. It means to "proclaim or describe glorious attributes of God". When we praise God we are, in a way testifying of His glory and greatness. Listing the attributes of God is a form of Praise. The different types of praise are numerous and can be discussed in great detail which is not within the scope of this post, but the working definition within this article, for the sake of simplicity is "exalting or magnifying God". Worship is the act of coming to God in a humble and adoring fashion and expressing love for God and His attributes. The act of worship is called adoration, which is showing deep love. At times we confuse a worship service with actual worship. Worship does not require music or songs, only the declaration of love, in humility, to God. The closer you get to God the easier it is to be humble in your worship, because in 2 Cor. 3:18 Paul tells us that when we behold the glory of the Lord it is as if we are looking in a mirror and it is very humbling for us to see ourselves compared to the glory of God. Yet the more we go before that mirror which is the glory of the Lord, we will then be able, by the Spirit, to be more like Him. It's just like looking in the mirror each morning, it may not be a pretty sight but it's easy to see what needs to be changed. The mirror can be skipped each morning, but that doesn't mean that teeth have been brushed. So in prayer the more we behold the glory of God the more we can be like him. Thanksgiving is the act of expressing gratitude. The process of thanking includes reflecting over the past and observing and proclaiming what God has done, and then thanking Him for it. Thankfulness is very similar to praise in that it recalls an account of what God has accomplished, yet the process goes on when gratitude is shown with it. It's the difference between saying, "God You are a Healer!" (praise) and "God You are a Healer, and I thank You for it!" (thankfulness). So many times in our lives we have needs that are so dire. There is always sickness, pain, financial difficulties, spiritual barriers and a host of other issues and situations that plague a Christian in their daily life. Supplication is the act of " asking for something humbly or earnestly." This is not to be confused with intercession which deals with the needs of others, but supplication deals with a personal need that only God can fix. Every time intercession is mentioned I think of Aaron, the brother of Moses, and how he stood between the living and the dead during a vicious plague that was killing the children of Israel (Num. 16). The definition of intercede is to "plead on another's behalf". It is the call of the Christian to intercede on the behalf of a lost a dying world. Prayer for the hurt, the lost, the broken-hearted must be a fundamental part of our prayer life. If you feel like you are spiritually dead in church pray for a burden to be put on your heart. There is nothing like the burden of a lost soul to wake up the spiritually lax, and there is nothing that causes a burden to be formed more than exposure to a need. So I encourage you to get out and see the need of your world, let it be a burden on your heart so that you may intercede until you get an answer from heaven. It is so easy to be hindered in prayer. There are moments when our prayers feel like they are changing the world and others when they barely leave our lips before they hit the ground. Praying is not optional, nor is it outdated for the modern Christian, but it is a necessity for nourishment of the soul.